[Satnews] Bombardier has confirmed that testing and validation for its Bombardier WAVE (Wireless Access Virtually Everywhere) global high-speed in-flight connectivity and productivity solution for the business aviation industry is nearing completion, following multiple successful tests aboard its Global aircraft experimental test bed. From left to right: Kurt Weidemeyer, Inmarsat VP Business Aviation; William Shatner; Jean-Christophe Gallagher, VP Strategy & Marketing, Bombardier Business Aircraft and Jack Jacobs VPGM – Safety & Connectivity, Marketing & Product Management, Honeywell. 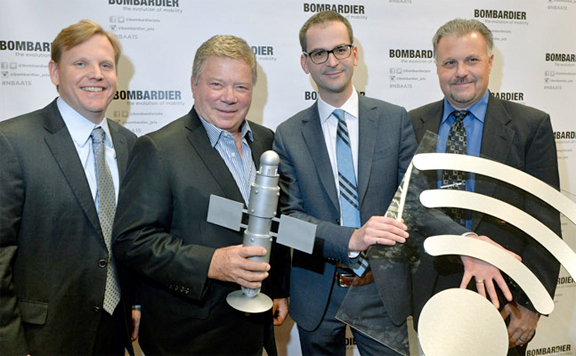 The update was announced during a press conference at business aviation trade show NBAA, attended by high-profile actor William Shatner, who earlier tested Bombardier WAVE first-hand onboard a test flight in the United States. Bombardier WAVE has been designed to provide a new standard in worldwide coverage and in-flight Internet access for the business aviation industry, leveraging the latest in satellite communication technology—Inmarsat’s JetConneX high-speed broadband solution and Honeywell Aerospace’s JetWave™ hardware. Bombardier is the first business aircraft manufacturer to make ultra-high-speed Wi-Fi services available in-flight globally and the first to offer performance commitments for network availability and speed. Passengers can now stage a videoconference, browse the Internet or stream online shows high above land and water, as seamlessly as they would on the ground. Bombardier WAVE features a wide range of service packages and comes available on new Global 5000, Global 6000, Global 7000 and Global 8000 aircraft, as well as a retrofit option for Global Express, Global Express XRS, Global 5000 and Global 6000 aircraft. The network of wholly-owned service centers will offer the first retrofit packages as of 2016, followed by progressive availability within the broader authorized service facility network. 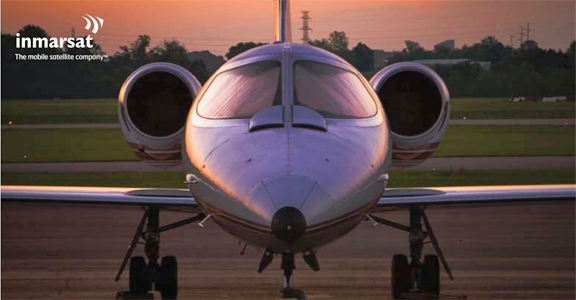 Inmarsat’s JetConneX service and Honeywell Aerospace’s JetWave™ hardware will deliver high-speed access, consistent performance and seamless coverage across the globe. Jet ConneX is powered by Inmarsat’s next generation Ka-band satellite constellation, which has steerable beams that can boost bandwidth in high traffic areas and direct capacity where it matters.